Thirteen-year-old Montgomery does not believe in magic. But then, he’d have said people don’t live hundreds of metres below London, yet here they are! And in the Underworld city of Lundarien they have eight kinds of magic - the ‘Magic Circles’. Here Montgomery meets Jarfin and others, who show him around the vast city caverns and even take him hunting in the Hanging Forest, and he soon feels more at home in the Underworld than back in his apartment on the Surface. But all is not well in Lundarien, what with the kidnappings, the stampeding monsters and the dark forces lurking in the Labyrinth, and Montgomery finds himself drawn into defending the city and his new friends against an evil tyrant, while unearthing his own magical heritage. We will send Montgomery's Trouble in the Underworld to your Kindle at . 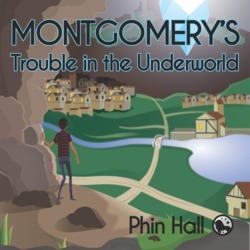 Montgomery's Trouble in the Underworld has been sent successfully to your Kindle!